I love mushrooms! Adding them to any meal can definitely add savor and enhance the flavor. It’s also very good to our health since it’s low in calories and sodium, free from fat, cholesterol and gluten. It’s also an excellent source of nutrients source of nutrients that have numerous benefits to our bodies, including the improvement of brain function. Yes! Did you know that there are certain kinds of mushrooms that can treat dementia, Alzheimer’s and other neuro-degenerative diseases? Quick facts: Alzheimer’s disease is the 6th leading cause of death in the US and every 66 seconds, someone in the country develops this disease. Now let’s find out what these edible miracle mushrooms are. In China and Japan, these mushrooms have been used for culinary and medicinal purposes for hundreds of years already. 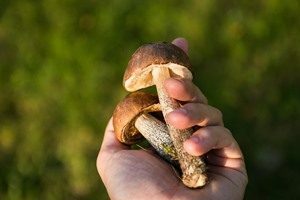 But recent studies show that it’s the only mushroom that can stimulate the Nerve Growth Factor (NGF), which plays an important role in the maintenance, survival and regeneration of neurons in the Nervous System. Other conditions that can benefit from Lion’s Mane are: Dementia, Multiple Sclerosis, Parkinson’s disease, Peripheral Neuropathy, Stroke Recovery and even Anxiety & Depression. In case you’re wondering, these mushrooms taste like shrimps and lobsters. These are increasingly being sold by gourmet food chains and are best when caramelized in olive oil, glazed with sake wine and cooked in butter. But you can also get it in powder form to easily add to your beverages or use in recipes. This “superfood” or should I say, “super-mushroom” has been the most sought-after and considered most powerful tonic in Traditional Chinese Medicine. It has a long list of good benefits to the body like boosting the immune system, promoting heart health, improving liver function, fighting diabetes and a lot more. But when it comes to its cognitive benefits, it’s said to enhance learning memory and improve brain function. Because of its bitter taste, you can opt to have it in tea form or powder to add to your meals. In a study published in Evidence Based Complementary and Alternative Medicine, it showed that Cordyceps can reduce inflammatory markers in the hippo-campus of the brain, which can impair memory as well as judgement and reasoning skills and can slow down cognitive processing. Cordyceps supplementation also helped raise NGF and 5-HTP which have positive benefits to the memory and mood. You can easily find whole, dried or even powdered Cordyceps in many natural health food stores and can be used in soups, stews and stir-fry dishes. You can also have it as a tea if you like. Even though studies claim that there are no negative side effects, it’s still best and strongly advised to consult with your doctor first before consuming any of the mushrooms mentioned above.